When it comes to trademark search, Trademark Electronic Search Database is one of the databases that are used overwhelmingly by trademark search professionals or trademark search firms. 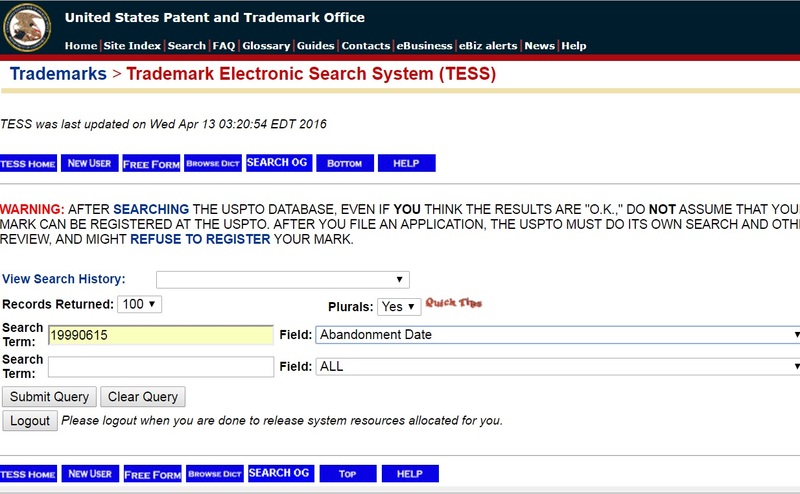 The database also called as TESS is provided by the United States Patent and Trademark Office and is one of the sought after trademark search databases in the planet. Once you are well-acquainted with this database and various trademark search fields we use, most of our trademark search related work will be lessened. 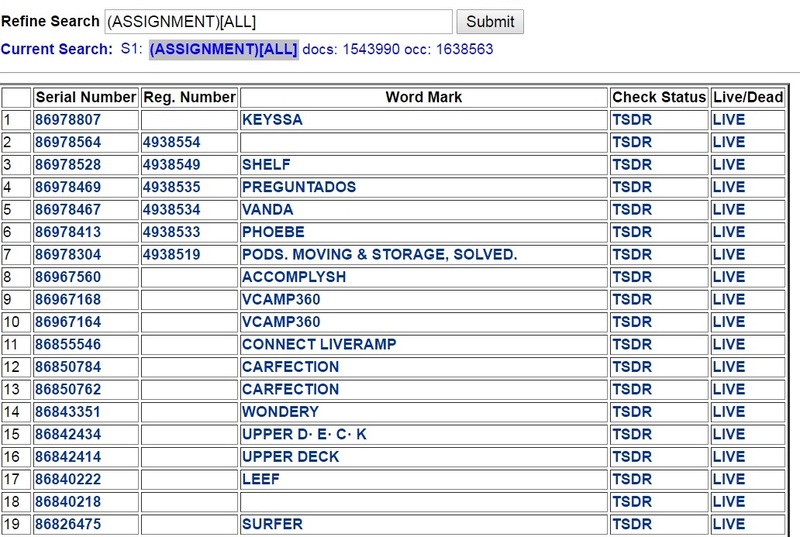 Mastering this database will help us do our trademark search efficiently and comprehensively. 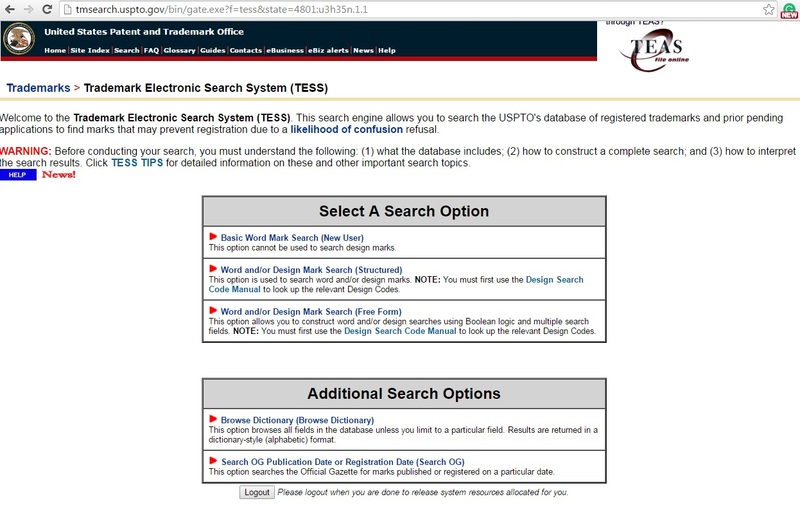 The Trademark Electronic Search System or TESS is a trademark search database provided by the United States Patent and Trademark Office to trademark search professionals in order to find trademark related relevant data. There are various fields available in the TESS database that a searcher can use to refine their subject as per the objective. The names of these fields are mentioned below and are of great help in achieving maximum output at minimum inputs. With this search, we can refine our search on the basis of if the trademark is active or if it is abandoned. 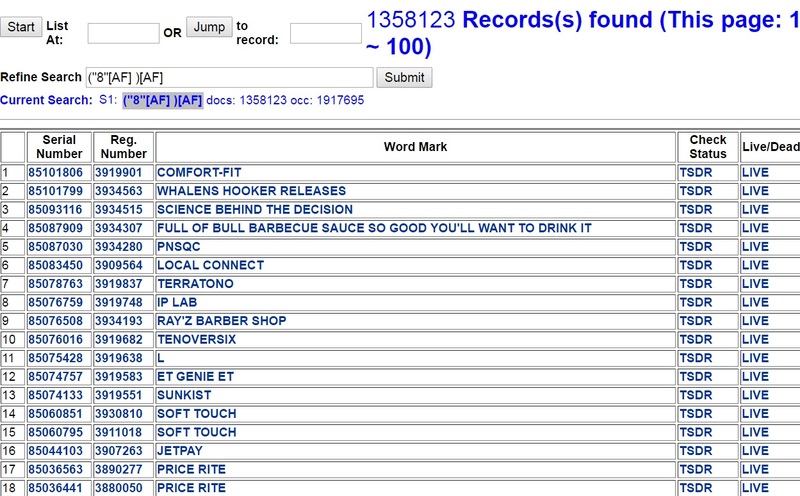 Many trademarks become abandoned due to non-payment of renewal fees. This field contains the date the mark was abandoned and is applied only to dead marks. Dates are stored in the format YYYYMMDD for the four-digit year YYYY, the two digit month MM and the two digit day DD. The $ (unlimited) and ? (single character) truncation operators are appropriate for use in date searches. For example, the following search with the key string 19990615[AD] will retrieve all marks with an abandonment date of June15, 1999. The Affidavit field is another important field that we can use to pull relevant data pertaining to trademark. This field is valid only to registered trademarks. This field contains notations on the types of affidavits filed on registrations. It refers to either or both Sec. 8 and Sec. 15 of the trademark law (Lanham Act, as amended), or to Section 12(c) for pre-1946 registrations. The data belong to this field can be mainly of three kinds depending on the nature of the trademark filing. Section 8: These affidavits are required for both the Supplemental and Principal Registers to show continuous use of the mark since registration. A Section 8 Affidavit must be filed between the fifth and sixth year anniversary of the registration date in order to maintain the registration. Section 15: These affidavits apply only to Principal Register. They must be filed within one year of any five-year period of continuous use to confer a status of incontestability in the registration. Section 12(c): This affidavit may be filed for a registration that registered under trademark legislation that was in effect prior to the Lanham Act which was enacted in 1946. By filing this affidavit the registration takes on the benefits as well as the responsibilities (such as the requirement to file a Section 8 affidavit) of the 1946 Lanham Act. Enter one of the following terms (using quotation marks) in the text entry box: “8”[AF] , “12C”[AF] or “15”[AF] . This field contains the words Assignment Recorded for those records that have an assignment recorded at the US Patent and Trademark Office. The search ASSIGNMENT[AR] will retrieve marks that have an assignment recorded. This field contains the name of the attorney as specified in any power of attorney submitted with the trademark application. Note that the power of attorney expires when an application matures into a registration. TIP: Since this information may be not updated in the database and is often changed prior to registration, you should contact the US Patent and Trademark Office or examine the application file to ensure retrieval of current information. The Coordinated Class Field is used by trademark search professionals to retrieve marks from International Classes related to a specific International Class. The Coordinated Class Table was designed to automatically include related International Classes in the search results when the primary International Class is searched. This field is used by trademark search service providers to identify the class assigned to a mark under the International Classification of Goods and Services (Nice Agreement) based upon the goods or services on which the mark is used. 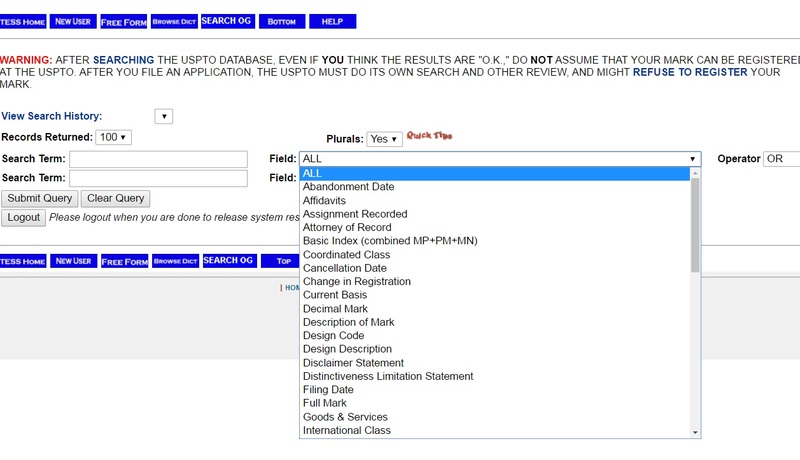 The Filing Date field in the TESS database is used to retrieve date when a complete application was received by the USPTO in the format YYYYMMDD. The $ (unlimited) and ? (single character) truncation can also be used suit your search as per the need. This is one of the most important fields used by trademark search professionals to identify the nature of the goods and/or services as set forth in the application or registration. For more details about this field, a searcher can see Acceptable Identification of Goods and Services Manual. This field contains the date on which a mark was registered by the USPTO. This field applies only to registered marks; pending marks will have a registration date of 0. Dates are stored in the format YYYYMMDD. The $ (unlimited) and ? (single character) truncation operators can be used in date searches. This field contains the unique identification number assigned by the USPTO to trademark applications that have received a filing date. 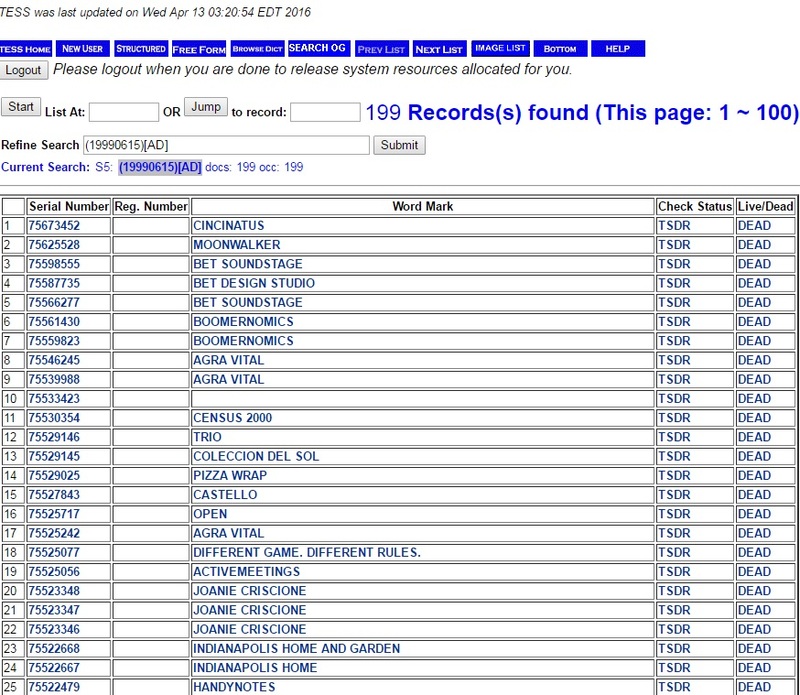 Search for a specific record by entering its full 8-digit serial number. This field contains the name of the individual or organization having controlling interest in the use of the mark. This field contains the unique number assigned to applications that have received approval for registration. To search this field, use the seven-digit registration number (with leading zeros if not seven digits). All we can say is that if trademark search fields are used meticulously and consciously it can give us tons of information and we can accomplish a comprehensive which we can analyze and interpret to make informed decisions about our trademarks. Using these fields prudently can help us achieve a comprehensive trademark search. All these services are provided diligently by a team of experienced professionals at TTSC. You are only required to provide us your mark details by placing your order online. Your search report will be ready within 3-4 days. For more information on our services and pricing structure, please visit our service page. Some free sample search reports are available on our website, have a look! For further clarifications, please feel free to drop a mail at info@thetrademarksearchcompany.com. We will get back to you soon. This entry was posted in Blog and tagged EPO, Lanham Act, registered trademarks, TESS, TESS Database, trademark application, trademark applications, Trademark Electronic Search Database, Trademark Filing, Trademark Office, trademark search databases, trademark search firms, Trademark search professionals, trademark search service providers, United States Patent and Trademark Office, US Patent and Trademark Office, USPTO. Bookmark the permalink.